A quick review this week! 45d, ADULTING [Doing grown-up things, in modern lingo]. 47d, ADORKABLE [Endearingly awkward, in slang]. 48d, HOTHEAD [Easily angered sort]. 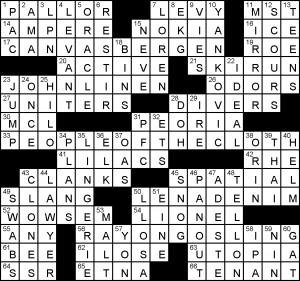 The clue [Number 2 or 6] refers to the second and sixth US Presidents, John and John Quincy ADAMS. Lots of theme entries, and I thought they were all really well chosen and fresh. You know me: I love a rebus puzzle. This was no exception: the aha moment was a lot of fun, and I thought the revealer was great. Lots of other fun fill: MEGA MAN, HOLINESS, WEBINAR, FT. SUMTER, FEE-BASED, LESS IS MORE, SEE ‘N’ SAY, TILAPIA, NERDS ROPE!. Had trouble parsing RANGE TOP, especially with the killer clue [Place for pilots], and almost flubbed the crossing with AT ONE’S PEAK because I really wanted that entry to end with “speak”. A little bit of grungy fill throughout, but for me the tradeoffs were minimal and totally worth it. We’ve had quite a few debuts lately in the WSJ, and here’s another one. Daniel Schmit appears to be making not just a WSJ debut, but a cruciverbial debut, alongside veteran Mary Lou Guizzo. Today, they’ve cooked up a filling theme to satisfy your Thursday craving. Each of the four long Down entries is actually going in the Up direction, and each is an item that you fill with something else. 5d [Place for a dip] SWIMMING POOL. This was a super sneaky way to start things off because the first four letters reading down are LOOP-. 11d [Michelin’s Cyclocross Jet, e.g.] BICYCLE TIRE. Wow. I had no idea that BICYCLE TIREs had names. Also, isn’t that a dupe in Cyclocross and BICYCLE? 21d [Premium place] GASOLINE TANK. This would’ve made a great central entry as the 7-letter GAS TANK. Nobody ever says GASOLINE TANK. Great clue, though. 24d [Spot for an overnight guest] AIR MATTRESS. This is the one that gave me that satisfying a-ha moment. This was fun to suss out especially because of that LOOP- situation I mentioned. I basically uncovered the entries left-to-right, so as I was solving them, I was also determining what was the filling element. First was air, then water, then gas, then…air again. That was a little bit of a letdown. It would have been a touch more elegant if each item was filled with a different thing. How about a BEAN BURRITO? I’m loving that upper left corner with OPEN FORUM stacked atop CATALONIA. The lower right counterpart of IN ESSENCE on REMATCHES isn’t as showy, but it certainly works. Other goodies: COMPUSA, SKEETER, GO STAG, MAKES DO, SPIRITS, DOTCOM, and the Greek isle of LESBOS which has been in the news recently for painfully sad reasons. O’ROURKE was tough with that clue [Ted Cruz’s 2018 Democratic challenger Beto]. I have not followed this race, but it will be worth watching from here on out. I loved seeing Kevin KLINE at 18a (especially since I remembered to spell it correctly and not KLEIN) given that clue [“A Fish Called Wanda” Oscar winner]. One of the funniest movies I have ever seen. Constructors! His character was named Otto, so…have at it. Clues were Thursday tough, which means possibly bordering on the edge of trivia, but crossings seemed mostly fair to me. MAEVE [Thandie Newton’s “Westworld” role] crossing VANED [Like windmills] at the V was a little sticky for me. And DEMI [Patrick’s “Ghost” co-star] crossing the trickily clued DOC [Happy co-worker] might have caught some people. If you didn’t know that DEMI Moore was in Ghost and that the second clue was talking about dwarfs, I can see where you’d have some trouble. Favorite clue: [Work for chicken feed?] for PECK. Tee-hee. Nice theme, strong fill, and mostly good clues. 3.8 stars from me. Here’s Kevin KLINE as the reprehensible Brit-hating Otto. Warning: NSFW language throughout. Can’t say I enjoyed this puzzle much. Although gender-inclusive language is nice, PEOPLEOFTHECLOTH in quotes has 825 hits on Google. It’s not in use. The puzzle itself takes arbitrary famous people and changes one part of their to be a type of fabric: (CANVAS) CANDICE BERGEN, JOHN (LINEN) LENNON, LENA (DENIM) DUNHAM and (RAYON) RYAN GOSLING. The rest of the puzzle, although we did get Weird Al Yankovic, had some real clunkers. UNITERS/RESTIR – crossing fake words! WOWSEM is also just a made-up roll your own bit. ORIN is a dentist, but given the difficult abbr. crossing it we got an easy, if plug-ugly partial clue. Some less than obvious abbrs. RHE is apparently “Runs Hits Errors” though the clue is rather vague. I initially thought it must be a team like ATL or CLE. I know AMA is Ask Me Anything, but if you haven’t been on reddit, the letters will be meaningless. This entry was posted in Daily Puzzles and tagged Daniel Schmit, Grant Thackray, Lewis Rothlein, Mary Lou Guizzo. Bookmark the permalink. This was a really fun Thursday – loved it! 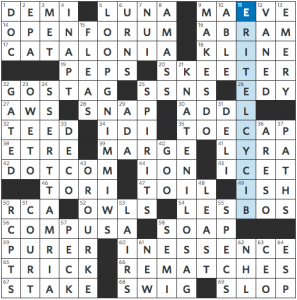 I really liked the NYT as well, but I have to ding it a few points for ADIEU and ONADATE. I guess the software can’t block everything, but still don’t like that those ADs slipped through. I didn’t notice those ADs, but I did notice POP-UP with a block next to it. That distracted me for quite a while. But otherwise, a fun puzzle! LA Times- That was one UGLY south east corner today. Ugh. 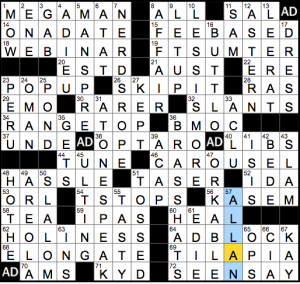 NYT: alas, what with two gamer clues, the candy, the toy, and lots of slang, I was way too old for this one. WSJ: looks like the only cue to enter rising is the title, not as with the NYT treatment of AD within. Unusual. Is that ok? Oh, and I forgot Casey. I was surprised by the answer to 32-D in the NYT – no idea that there was a university that old in Peru. And the formal definition of the Western Hemisphere (west of the prime meridian, east of the antimeridian) includes most of Spain, where the University of Seville, the University of Granada, and the University of Zaragoza all pre-date the National University of San Marcos in Peru. Maybe “Home of the oldest university in the Americas” would have worked better? I had skimmed comments earlier and somehow missed yours. I agree that PERU is not a correct answer for the clue. Re your Encyclopedia Britannica note: Wikipedia says Universidad Autónoma de Santo Domingo was founded in 1538, but closed from 1822 to 1914, and that Peru’s University of San Marcos, founded in 1551, is “the longest continuously operating university in the Americas.” That still doesn’t make it the oldest in the Western Hemisphere, which should be the University of Oxford, per my comment below. 23D. “Home of the oldest university in the Western Hemisphere (founded in 1551)” = PERU. How could the oldest university in the Western Hemisphere not be the University of Oxford in England, established circa 1096 and considered the second-oldest university still operating today (after the University of Bologna)? The Western Hemisphere includes anything west of Greenwich, no? Oxford is west of Greenwich. That is one definition of Western Hemisphere, but it’s also sometimes defined (at least colloquially) more narrowly to mean the Americas. Perhaps not the most artful clue, but I’m not sure it’s wrong. There may be a M-W definition that “half” is “less than 50%” but I haven’t looked it up. not really. the pacific is huge. if you considered “surrounding waters” to include from the Atlantic midpoint to the Pacific, you’d get a lot of the globe. Is that like the way the NYT defines the U.S. as the part that lies within 100 miles of the Atlantic or Pacific coast? The problem with the most straightforward definition of the Hemispheres (using the Prime Meridian) is that Oxford is in the Western Hemisphere while (whilst?) Cambridge is in the Eastern Hemisphere. That is why from the 17th-century, cartographers used the 20th west and 160th east meridians to mark the Hemispheres, leaving the Old World out of the Western Hemisphere entirely. It’s a definition that’s used enough to justify the clue (along with M-W) but is not an unambiguous standard, so that putting Oxford and Cambridge in different Hemispheres is not incorrect either. Just weird. Occurred to me, too, although I hated to do the research to confirm. I think of Shakespeare hitting London around 1585 and trying to hang out with types like Marlowe who went to university. It wasn’t that young an institution! Actually, fair point about AD BLOCK. The product I had was called AD BLOCK PLUS, and I had to give it over for technical reasons anyway.